Biosphere 2 was an architectural wonder built in the Arizona desert to contain the living eco-systems of Earth’s biosphere inside a structure that would model a living, breathing, life-enhancing support system to the world. The crew who built Biosphere 2, lived inside it, and demonstrated how the biosphere was a delicate living system, needing care and management, but could be successfully contained and thus reproduced if necessary to support life off planet as well as here on Earth. They were misunderstood, maligned, judged and forcibly evacuated from their experiment, suffering greatly at the loss and violent takeover of their visionary adventure in sustainability that was years ahead of its time. Still coming to terms with what happened and fully aware of the parallels between the unnecessary destruction of Biosphere 2 and what is happening to Biosphere1 (the Earth), they asked if an Earth Treasure Vase could be buried there, for the healing of the Biosphere. One day, their full story will be told. Here is the story of what happened when we buried the vase in a canyon just below Biosphere 2. Through me rushed a deep cavern of tears, sorrow and pain. A world gone, I thought. So much was lost in so short a time. In fact, it was overnight that the bankers and police rolled in to take over the largest miniature world ever created, a laboratory for the study of global ecology – an ecology that could only be created by the uniqueness of Biosphere 2’s design, function and form. I had seen it, built it, lived it and become it. It was part of me still even though the structure and its life systems had been almost entirely destroyed over the last decade. Stepping off the plane at 7:05 pm in Tucson, Arizona on March 19 we walked surely, as if we were a “special force” team: Cynthia, Hugh, Gaie, Laser, Sandy, Ron, Cyndy and Carl. We moved bright-eyed with purpose…with less than 24 hours to accomplish our mission. Our next port of call was our favorite restaurant, to meet Bill, Marie and Sierra. Time was ticking and the magical act had commenced. Retracing our steps from the decade past, Le Bistro made sense as the place to rendezvous. Celebrations there were a tradition, including dinners before we entered Biosphere 2 on September 26, 1991 and when we came out again on September 26, 1993. In the spirit of celebrating Biosphere 2, we arrived at the restaurant. Toasts that evening sparked meetings between individuals who had previously never met. Anecdotes were shared. The moment appreciated and honored. It was a new chapter and each understood the significance of our strategic plan to bring healing where it was needed. “Its time” said Laser as he woke me the next morning at 5:30 am on the Equinox. We joined Cynthia and Hugh and unpacked the wooden box that held the vase. It was a box that Laser had made to safely protect the vase as it traveled from Santa Fe to Arizona and to house the vase as its new home below ground. It was inlaid with a green and white silk tacked to the wooden interior with a copper mesh covering the entire outside. The top was decorated with two silver leaves and a butterfly. Inside, under the vase, was a photograph of the people who dreamed Biosphere 2 into reality. We sat around the table to bless the vase. Rose petals, peacock feathers, and marigold flowers were placed around the vase, nesting it into the box. Lovingly we closed the lid and in a flick of an eye, the Tibetan alter that Cynthia had made for this blessing vanished into her rucksack along with the bell that harmonized us to move to the next phase of our journey with mindful purpose. 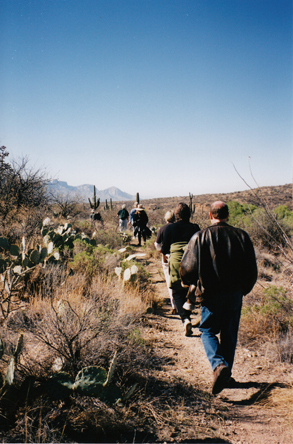 The last time we had been to Canyon del Oro was when Laser and I had heard the tragic news that off-duty cops and lawyers had seized Biosphere 2 – an act that led to its ultimate demise as a closed system. Looking up at the ridge-top where Biosphere 2 lay just beyond, my eyes softened as I took in the cacti landscape that I loved and the ranch house that had been my home. Adventure occurs when opposition arises to defeat the objective and in a flash of realization we were standing at that gate. Could we get past this lady and perhaps others living in the surrounding area in order to get up the trail into the mountains below Biosphere 2? The land we sought was not on private property but to the East, up into public land, and there we hoped to find the spot for our vase. I looked behind me at my friends and knew that I had to succeed. With soft conversation and expressed urgency for her help, the lady in the early morning sunlight agreed to allow us to picnic in the Canyon del Oro. We shared a love for this Canyon and through that we became friends. She expressed her pain about the onslaught and intrusion of development companies who were moving ruthlessly into these wild Catalina Mountains. Comrades, we exchanged agreements, said and unsaid. My friends became her friends and she escorted us to her path, which would lead up the Canyon to the land we wished to reach. We reached a bend in the path, a fence with an old wire and wooden gate stood ahead. Opening it, we crossed into public land. We looked behind and all was silent. The barking stopped. We looked ahead and all was quiet. Saguaros rose like sentinels watching the land. Earlier, a coyote had crossed our path; we knew we were on the right road. Hawks soared above circling a location ahead. We breathed the crisp morning air and knew the spot lay ahead. was it. Fifteen minutes later, we turned a bend and the path took us down to the riverbed. Looking up at the opposite hill we saw a spot that was not on either slope of the two riverbed slopes, but right in the middle. It called us to step onto its slopes and there we found the spot for Biosphere 2’s Earth Treasure Vase. I could see the old ranch house far above; it was my lifeline to this new lifeline. 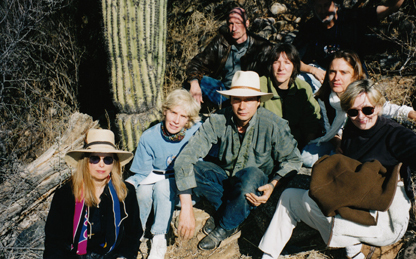 Hugh was our guardian below; Sandy watched on a rock above and a double saguaro stood at attention to the West. Laser with his memorable little shovel from the groundbreaking of Biosphere 2 began to dig while Cynthia blessed the ground and vase. 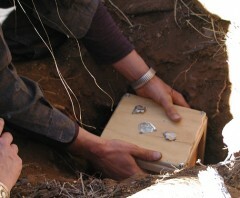 A large rock was removed from the bottom of the hole and with that gesture, the box with its vase disappeared under the brown dirt while many hands reached together to cover, secure and hide its form. A two-foot rock was rolled on top to be sure nothing would endanger our precious gift to the Biospheres. Our journey complete, my heart leaped into the morning air. It was about 9:30 am. Our vase was buried, we were okay, and I was on land that I loved and that loved me. I was home. My fellow Biospherians joined my rush of merriment, Sierra and Marie beamed. Laser bounded back down the path where two white-tailed deer joined us. We felt something new had been initiated in the Canyon of Gold and joy filled our hearts. This entry was posted on Thursday, June 6th, 2013 at 12:37 pm	and is filed under Burials. You can follow any responses to this entry through the RSS 2.0 feed. You can leave a response, or trackback from your own site. This increased my interest and hope for the future. The whole idea was enlightening for you all I’m sure(and very brave).I just hope that the idea doesn’t vanish. There could be other steps made. why give up here? .I hope we keep striving and learning better methods. You guys took the first steps into a man created recyclable environment.That has to be like taking the first steps on the moon. You understand this?I hope this doesn’t end here.I also don’t understand why there is a price hanging over the head of the possible rescue of biosphere 1 via biosphere 2.That part makes me sad. 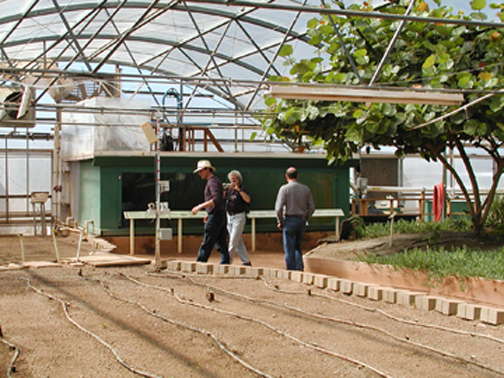 The Biosphere 2 project still lives on as a teaching. The fact that it was dismantled and taken apart, the organic agriculture removed, the people removed from the process, and the general confusion and chaos around the project is a similar story about what is happening in Biosphere 1. 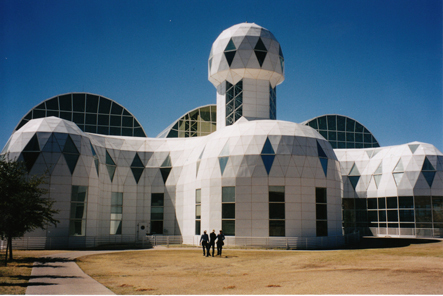 So yes biosphere 2 continues to be a laboratory for the study of our global ecological situation…. as for the knowledge we gained about living intelligently with a biosphere, that is very much alive in those of us who lived it.